Tags are the perfect addition to any charm, bracelet or pendant and can feature a name, date, short message or birth stone. You can have even a bracelet or pendant which is all tags! These also make great gifts as you do not need a child’s fingerprint if buying for someone else. For a word only on your tag select ‘Tag’. To add a birthstone (with or without a word) select ‘Birthstone Tag’ – Please see our birthstone guide below. All gemstones are round and 4mm in diametre. Like charms. tags can be purchased separately to add to an existing piece of jewellery or to add to your jewellery as your family grows. All tags are supplied with a 5mm open jump ring so that you can add it to your own jewellery. However, because you are fitting it yourself and it is not soldered we do not guarantee its long term security – if you wish this to be soldered onto your own bracelet there is an additional £5 charge for each soldered item - please bring your jewellery to your appointment or post to us using the insured Royal Mail Special Delivery if ordering online (this usually costs £6-8). Larger (8mm) jump rings to attach your tag to Troll Bead or Pandora style bracelets are available too, also at an additional £5, and tags with a soldered lobster claw attached, enabling you to clip your tag on to a chain or Thomas Sobo style bracelet, is £8 . You can select these jump ring choices in the ‘Extras’ drop down menu. These gemstones are the recognised birthstones for the UK and USA. Please note some birthstones are not available with PMC as they have to be fired with the silver. Therefore we use laboratory grown synthetic replicas which are kiln proof. You may find some of these stones differ to other charts you have seen – every month has many options! 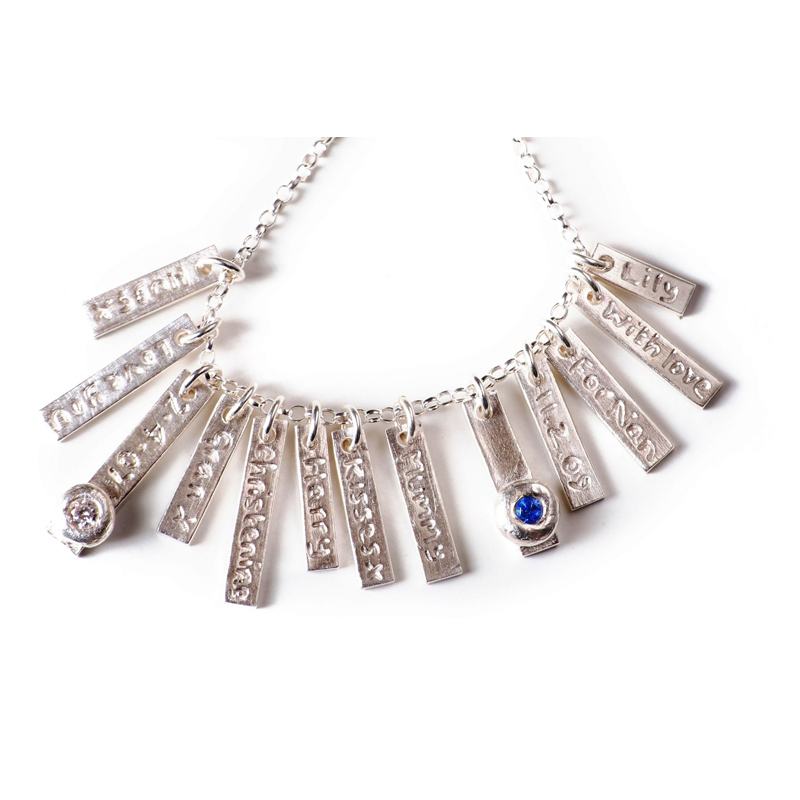 IMAGE SHOWN: COLLECTION OF VARIOUS TAGS AND BIRTHSTONE TAGS ON FINE BELCHER CHAIN. THIS PRODUCT INCLUDES ONE TAG ON A 5MM OPEN JUMP RING.